Japanese Tree Lilac is an attractive, heavy-flowering lilac with fragrant white blossoms. 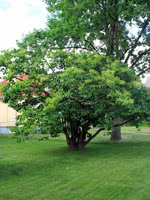 It can be pruned to a single stem or grown as a multi-stemmed shrub. Japanese Tree Lilac's dark reddish-brown bark peels as the tree ages, creating visual appeal for any yard, especially in the winter. This tree is often planted along boulevards and its attractive white flowers signal spring to all who drive by.